Add the sifted flour (the weight of flour is always identical to the weight of butter). ...to prevent browning and the formation of lumps. 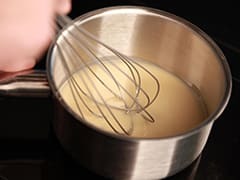 The roux must be perfectly smooth and white. Cook for 4 to 5 minutes. When finished, set aside to cool until you need it.